1990 was a Berlin summer dominated by the Mauerspechte - literally the 'wall peckers' - who chipped away at the Wall with chisels, often in the hope that fragments of the legacy of a divided Berlin could be sold to the tourists who were then thronging the city centre in their thousands. One of the wall peckers was Christoph-Manuel BrambÃ¶ck. No-one is going to be celebrating Christoph-Manuel Bramböck's birthday this year. Christoph-Manuel was born on 1 October 1975, so his birthday falls just two days prior to the German public holiday that recalls the unification of the two German States on 3 October 1990. Christoph-Manuel lived in the Berlin suburb of Lichterfelde, just a few streets away from where we write these few words in memory of the last victim of the Berlin Wall. Cast back to those heady days when a carnival of revolutions was transforming Europe. Mikhail Gorbachev, the quiet architect of change, was still in power in Moscow. 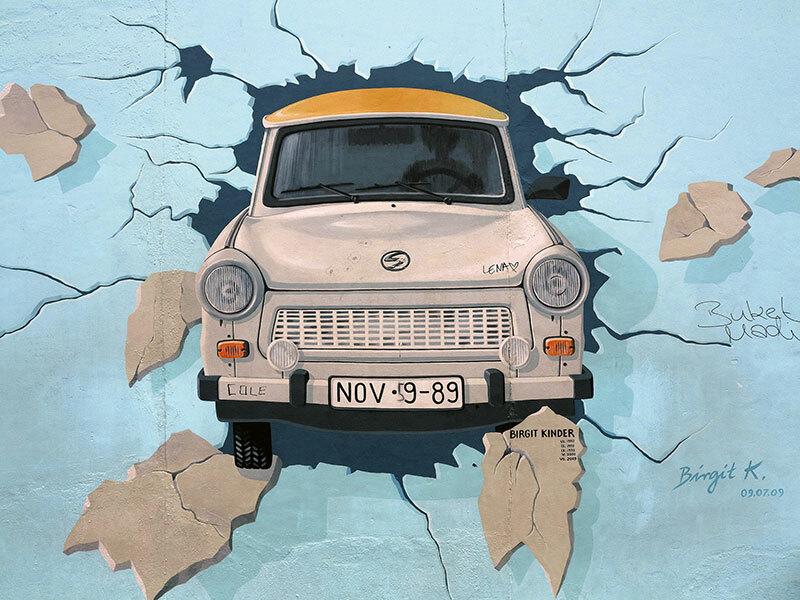 The dramatic events of November 1989 had given Berlin a chance to reinvent itself, and by the summer of 1990 sections of the Wall around Lichterfelde were already being demolished by the authorities. It was a Berlin summer dominated by the Mauerspechte - literally the 'wall peckers' - who chipped away at the Wall with chisels, often in the hope that fragments of the legacy of a divided Berlin could be sold to the tourists who were then thronging the city centre in their thousands. The principles of capitalism were easily assimilated and many kids spent their school summer holidays investing time and energy to get their share of the rich pickings offered by the disappearing Wall. Christoph-Manuel was fourteen that summer and was old enough to appreciate that his was the generation that might benefit the most from the upcoming unification of Germany. And he had his favourite sector of the Wall just east of Lichterfelde, a place where there was not such intense competition from other wall peckers. What a summer of hope. On 1 July, the East German Mark was consigned to currency oblivion as the German Democratic Republic adopted the Deutsche Mark. On the morning of Friday 31 August 1990, representatives of the two German governments met in Berlin and signed the Unification Treaty that was to come into effect on 3 October. 31 August 1990 was a big moment in German history. And late on the afternoon of that day Christoph-Manuel went with a mate to chip away at the Wall that had divided Germany. The Wall in this area consisted of vertical upright pillars that supported horizontal slabs wedged between those pillars. Each concrete slab was about two metres wide and some 30 cm deep. By late summer 1990, there were great holes in the Wall, usually only up to the height of the kids who were chipping away at history. Christoph-Manuel poked his head through one of the holes and worked away with his chisel. But as he chiselled at the Wall, one of the great slabs above became loose and plunged down on the boy. He died instantly. Christoph-Manuel would have been 35 this year. Who knows whether he would have reaped the fruits of German unification? The spot where Christoph-Manuel died is on the corner of a leafy meadow. No hint of the Wall nowadays, but there is a restrained memorial to the lad who really was the last victim of the Berlin Wall. You can see pictures of that memorial on our website.